On Cue Studio is pleased to announce the acquisition of the original screenplay “The Soprano and the Poet” written by Terry R. Herbert. This script brings to life original Jekyll Island millionaires, such as rivals, JP Morgan and Joseph Pulitzer, and the gossip of the Club, Almira Rockefeller. The beauty, legend and tragic drowning of a young Georgia starlet, “The South’s Sweetheart”, who in 1905 left Broadway’s lures, to bring its entertainment to Southerners, grips the heart of a present day young poet. He must survive the ferocity of velocity of an experimental time travel apparatus,shady renegade scientists, and arrive with only three days to try to win her love and to prevent her drowning. First hurdle, he must coax an invitation from a club member, overcome Jessica’s reluctance, her fame, the elite social circle of that era, and their rigid protocol enforced by J.P. Morgan himself. Waiting at the end of his quest is the deadly Riptide which threatens him with the same fate as hers. Terry’s script will be filmed on Jekyll Island featuring the beautiful grounds and restored cottages and clubhouse of the movers and shakers of the industrial revolution. Terri Zinner, a top script consultant in Hollywood, compares this film to the 1980’s gems,“Somewhere in Time” and “Back to the Future”. This is the second of Herbert’s scripts that On Cue Studio has acquired, the first being “The Legend”, designed as a one hour special for cable. We are excited about these filming opportunities and we look forward to a long and mutually rewarding relationship with this talented screenwriter who seamlessly brings stories of past centuries to life in living color. 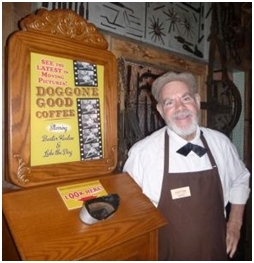 Herbert performed his poetry published under the title, “Love Tides & Golden Isles Lore” with CD’s, Shakespeare and storytelling from memory at multiple five star resorts in the Golden Isles of Georgia, including the Jekyll Island Club Hotel where Herbert conducted horse drawn carriage tours in the early 2000’s. He was nicknamed, the Golden Isles Poet by the Cloister Resort, (currently listed as the number one resort in the nation) a title Herbert held for over a decade. Herbert was taught by leading screenwriting authority, Hal Croasmun, president of ScreenwritingU having graduated from Pro Series 34 in 2012. Herbert has received a “Consider” or “Strong Consider” on all of his completed scripts, and a rare “Recommend” on himself, as a screenwriter, from one of the industry’s top coverage consultants, Terri Zinner.